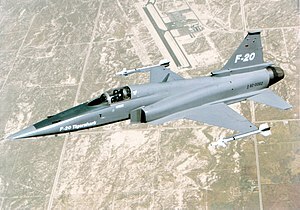 Johnsen, Frederick A. Northrop F-5/F-20/T-38. North Branch, Minnesota: Specialty Press, 2006. ISBN 1-58007-094-9. ^ Johnsen 2006, pp. 94, 96. ^ Donald, David, ed. "Northrop F-5 family." "Northrop F-20A Tigershark." The Complete Encyclopedia of World Aircraft. New York: Barnes & Noble Books, 1997. ISBN 0-7607-0592-5.